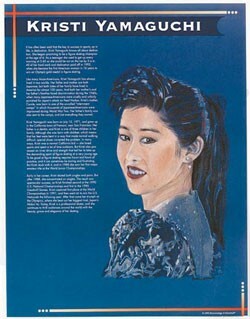 This educational poster features an original illustration of champion ice skater Kristi Yamaguchi, along with a concise biography. 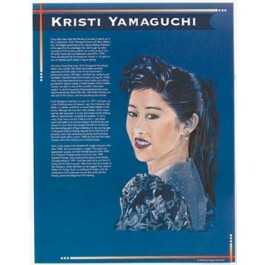 Kristi Yamaguchi was born in 1971 to Japanese-American parents whose families had lived in America for 100 years. She was born with clubfeet, but special shoes corrected the problem. She started skating at age 6, and worked very hard at her sport. It paid off. In 1992, she became the first American woman in 16 years to win an Olympic gold medal in figure skating. This unique poster is a great way to introduce students to this great Asian-American athlete.